Lucea Jamaica Wedding. 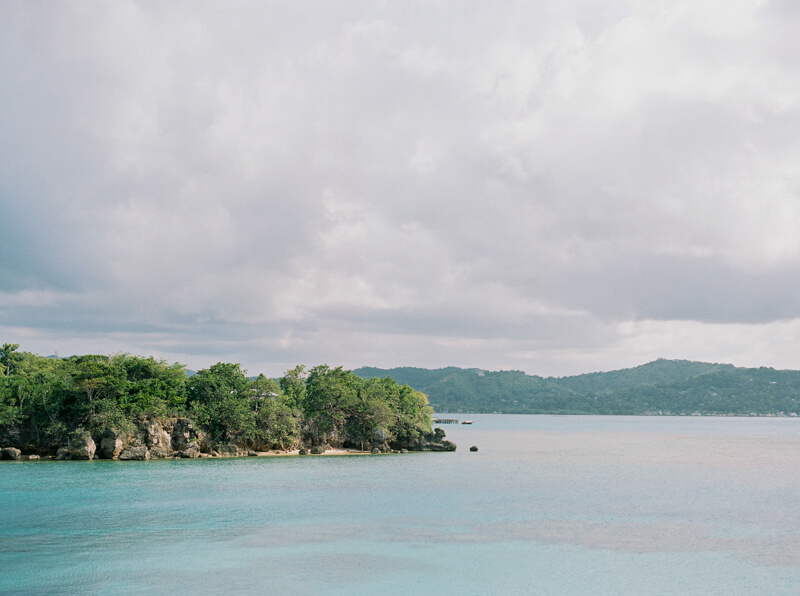 Julie and Marty were married in Jamaica and the inspiration behind their big day was, of course, vacation! The couple had previously visited the tropical paradise in past vacations and knew it was the ideal place for their special day. So, they treated 60 friends and family for a weekend of island bliss at the Grand Palladium Jamaica Resort. The overall impression they wanted for their wedding was small, intimate and fun and on a bright sunny day, the two were ready to say "I do." Julie and her bridesmaids all got ready together before the ceremony wearing matching off-the-shoulder dresses. 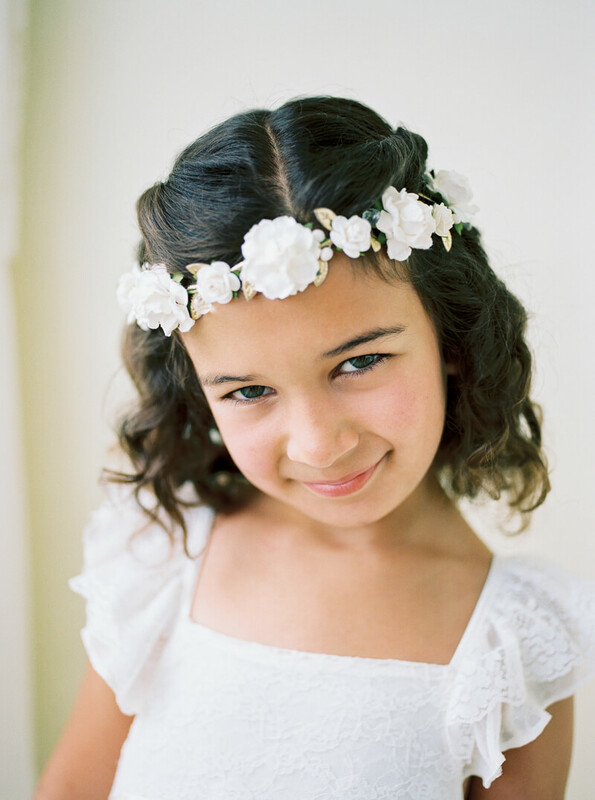 The couple’s flower girl looked beach-ready with a white sundress and white flower crown. Julie let her bridesmaids shine in styles that personally spoke to each lady. While everyone wore a long dress, the designs varied from V-necks to halters and the colors spanned the spectrum from blush to gray. Julie’s bridal style was definitely beach-inspired. She wore a fit-and-flare dress with straps that complemented her beachy waves. Marty and his groomsmen looked cool and casual in khaki-colored suits and white button down shirts. The ring bearers rounded out the handsome group with shorts and suspenders to match. Collectively, the couple’s 21-person bridal party was a radiant group of loved ones whose neutral styles balanced out the colorful location. Julie chose to wear a cathedral-length veil for the ceremony which elevated her beachy bridal style. With a small bouquet of white flowers, Julie was elated and couldn’t look happier receiving a kiss from her groom. Julie and Marty had the look of love the entire day. From inside the resort to out on the beach, they couldn’t take their eyes off one another. Their reception took place on a patio overlooking the ocean. Its blue beams and white columns were a resplendent touch to the panoramic view. Their décor was crisp and simple with mostly white accents. But their white wedding cake shimmered with a sparkling personalized cake topper. And while the couple had many favorite moments, the best came the day after the wedding. 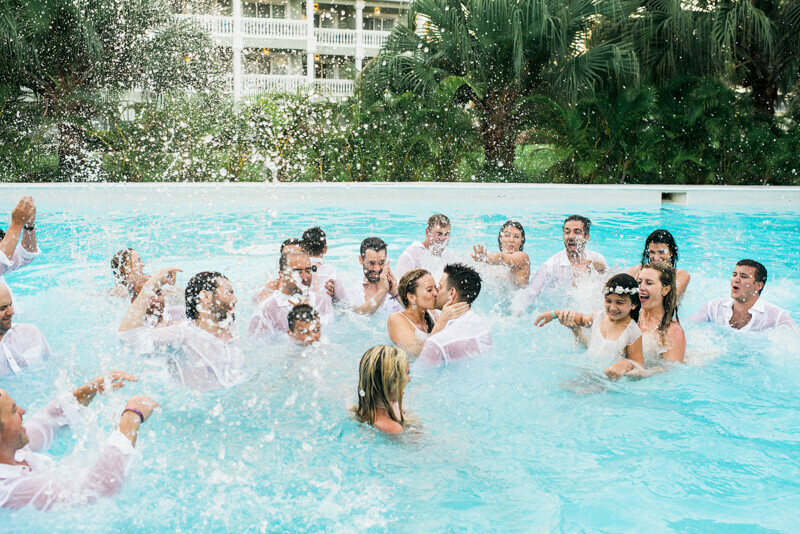 Julie, Marty and their entire bridal party donned their wedding clothes one last time and all jumped into the pool. 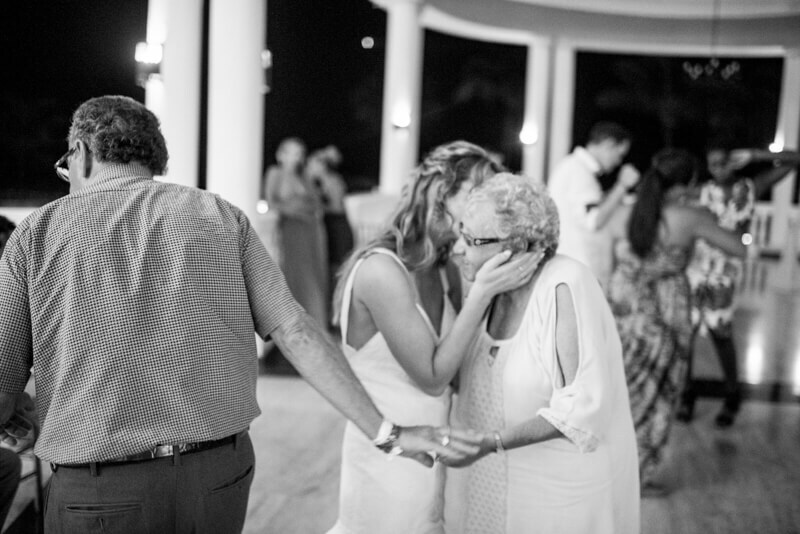 Julie and Marty’s wedding in Jamaica was fun, fabulous and full of life. Now, every time they set foot on Jamaica for future vacations, they’ll have a whole new set of memories from which to enjoy.